This is the crab net that we used when we go crabbing. At the bottom of the net, we tied the regular chicken or turkey neck as bait. So far, we only caught one crab each time we pulled it up. We check every 10 minutes though. Each person is allowed to bring six crab nets for crabbing. If you use more than six crab nets, you need to get a fishing license. 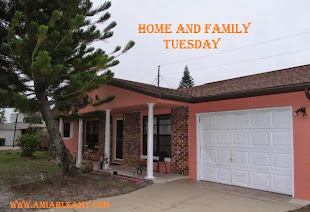 The best activities if you live near the beach are fishing and crabbing. If you get lucky, you will get more than five dozens in few hours. The old house of my father-in-law was the best property so far because he got his own private Pier. He can go crabbing whenever he wants and he used "crab traps". He sold that property after Hurricane Katrina damaged the property as high as the rooftop. 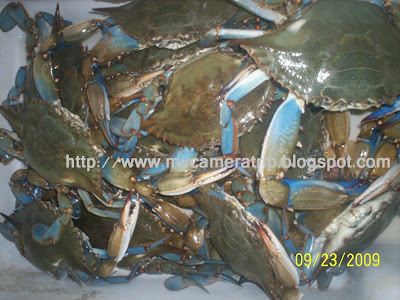 The picture above is already cook blue crabs. We were lucky because we caught more than a dozen crabs in three hours using 10 crab nets. On that day, we caught huge crabs too. You need to throw the crabs back into the water if the crabs are small or if the crabs are bearing babies. How to distinguished Male and female blue crabs? Look at their "aprons" or their abdomens. 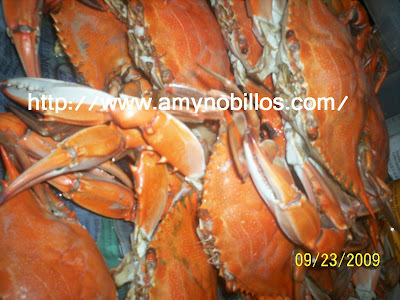 Male crabs have a long and narrow apron while mature female crabs have a wide and rounded apron. To remember, if the apron looks like the Washington Monument, the crab is male and if like the U.S. Capitol, it is female. Pretty clever huh? hahaha what a clever way to distinguish a malke and female crab. ako alam ko lang kumain ng crabs. buti nga natuto na akong mag open ng crab. b4 it was my late father who opened the crab for us, to his resentment every time because his eating is delayed.